experience the real Palermo, strolling with the nose in the air and savoring its authentic charm, step by step. Palazzo Brunaccini Boutique Hotel is located in the heart of Palermo, just a few steps from Casa Professa, many historical sights, shopping streets, restaurants and the Ballarò street market. Despite the close proximity to one of the most chaotic and cosmopolitan areas of the city, Palazzo Brunaccini is placed in a peaceful square. If at first its position could leave you skeptical, you will soon discover its unique advantages: the chance to enjoy a charming and quiet location and at the same time experience the different aspects of the everyday life. The Falcone Borsellino Airport is only 30 km away from the Hotel. Owned by Princess Lucrezia Brunaccini, this ancient palace is today a 4-star boutique hotel where the original shapes and atmosphere is still alive. It features both antique and contemporary furniture, soft neutral coolers and warm light. Palazzo Brunaccini Boutique Hotel hosts 18 rooms spread over different floors, a restaurants, a lounge bar and a meeting room. 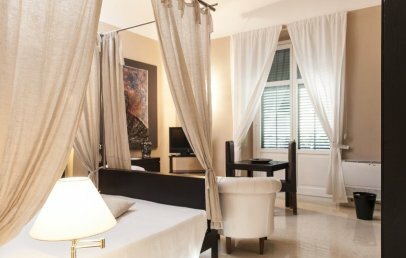 The rooms of Palazzo Brunaccini Boutique Hotel are large and comfortable and face the square or the narrow and typical streets of the old town. 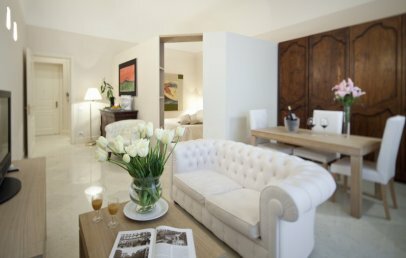 All rooms have parquet and marble floors, antique or design furniture and present en-suite bathroom with shower. Minibar with snacks Eataly (to pay). Rich buffet breakfasts and a la carte dinners, with delicious typical Sicilian plats, seasonal ingredients and bio-products, are served at “Brunaccini”, the Restaurant of Palazzo Brunaccini Boutique Hotel which also hosts theme parties and temporary exhibitions. The staff of Palazzo Brunaccini Boutique Hotel is at your disposal for touristic information, excursions, sport and leisure activities and booking. Available for guest: free Wi-Fi, room service, baby-sitting, laundry and ironing. Tourist Tax – € 2,00 per person, per overnight, valid for the first 4 overnights and has to be paid on spot. Comfortable double rooms with air conditioning, all modern comforts, parquet and marble floor. The en-suite bathroom provides shower, hair dryer and complimentary toiletries. 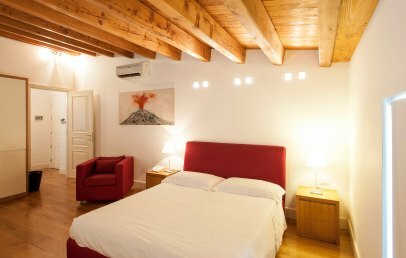 The Superior rooms overlook the square or the narrow and typical streets of the old town. Elegant and comfortable accommodations with a night zone and a small day zone with a hot tub for two with hydro-massage function. All rooms have air conditioning, modern comforts and private bathroom with shower, hair dryer and complimentary toiletries. 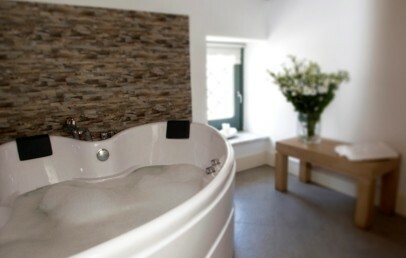 The Deluxe rooms have a view on the Piazza or face the narrow and typical streets of the old town view. Elegant and bright Junior Suites and fine furniture. Some have a four-poster bed, others an eating table and others a small balcony with lovely view on the Piazzetta. They are perfect for a romantic journey for a couple. All provide air conditioning, modern comforts and an en-suite bathroom with shower, hair dryer and complimentary toiletries. 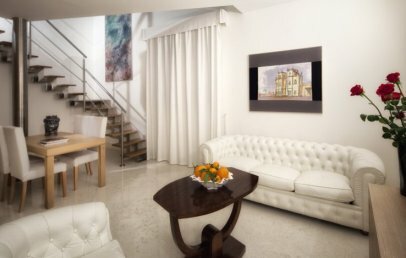 Spacious and elegant Suites furnished in a modern and comfortable style. There are two types of Suites. One has two separate rooms (living and sleeping room), a bathroom with shower and a balcony. The other Suite is distributed on two levels with night and day zone, two bathrooms with shower and big windows. The Suites are perfect for a stay with the family or who searches a large accommodation. They provide Wi-Fi connection, sofa bed, air conditioning, minibar, safe, flat screen TV with satellite channels. 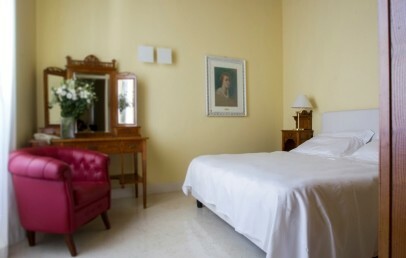 Comfortable double rooms with air conditioning, all modern comforts, parquet or marble floor. 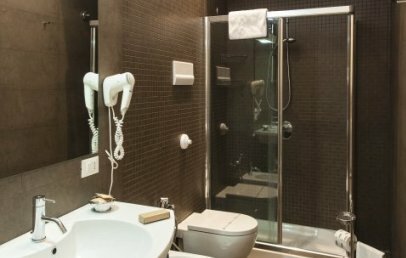 The en-suite bathroom provides shower, hair dryer and complimentary toiletries. The rooms have either a small balcony or windows and overlook the typical streets of the old town. Elegant and bright triple rooms and fine furniture. Some have a four-poster bed, others an eating table and others a small balcony with lovely view on the Piazzetta. They are perfect for a 3 people. All rooms provide air conditioning, modern comforts and an en-suite bathroom with shower, hair dryer and complimentary toiletries. 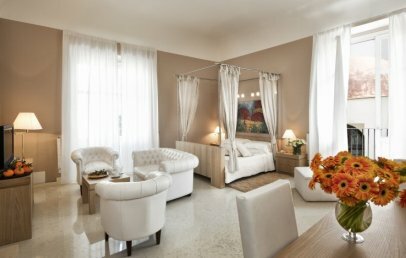 Spacious and elegant Family rooms furnished in a modern and comfortable style. They are all a bit different from each other, some have two separate rooms (living and sleeping room) with nice terrace and in liberty style furnished and others are distributed on two levels with night and day zone, two bathrooms with shower and big windows. The Family rooms are perfect for a stay with the family, as they can accommodate up to 4 people. They provide Wi-Fi connection, sofa bed, air conditioning, minibar, safe, flat screen TV with satellite channels. Advance Booking - Book at least 90 days in advance and get a 15% reduction on your stay. 15% reduction for stays from May 30th to June 2nd, booked within April 30th 2019 (min. 2 nights)! 10% reduction for stays from June 13th to 15th, booked within April 30th 2019! 10% reduction for stays from June 20th to 21st, booked within April 30th 2019! 20% reduction for stays from August 15th to 18th, booked within April 30th 2019 (min. 2 nights)! 10% reduction for stays from August 24th to 27th, booked within April 30th 2019! 10% reduction for stays from October 3rd to 6th, booked within April 30th 2019! 15% reduction for stays from October 31st to November 3rd, booked within April 30th 2019 (min. 2 nights)!